Tan Family Chronicles: How Spidey Gal met Kermit Prince! Unable to resist the call by June of MamaWearPapaShirt to share our love story, here I am to regale you with the story how hubbs and I met. We actually did a powerpoint slide of our story and screened it during our wedding church reception. It's in this post here, but *spoiler*alert* - you may wish to read this post below before viewing the powerpoint slides in the link given above. How Spidey Gal met the Kermit Prince! Hubbs and I first met, as in literally set eyes on each other, in year 2000. It was during a two day one night camp for children with physical disabilities organised by Happy Friends Club for the children of TeachMe. I have been volunteering with Happy Friends Club since 1999, but this was hubbs' first time. Our jobs as volunteers were simple. Each Volunteer was paired with a child to take care of him/her for the duration of the camp. As the children were physically disabled, the volunteer: kid ratio was 1:1. However, hubbs and I hardly spoke at all that first camp. I was still attached at that time, to my JC (junior college) boyfriend. Well it wasn't just me, he was attached at that time too. Hubbs is 7 years older than me, and hence was in the "Uncle" category, since I was still in uni at that time. He was unthinkably "too old" for me. Plus he was a serial smoker (bleeaauughh gross!!!). Point was: we didn't even give each other a second glance. Happy Friends Club is a 100% volunteer basis, and we weren't paid at all. It was quite easy to commit because we only organised camps twice a year: during the June and the December holidays. Each camp would be a 2 day 1 night camp. Well, usually! So over the next few years, hubbs and I would see each other every 6 months, during the camps. Then in 2002, we not only had the 2 camps for the kids, but also a Volunteer Camp for the volunteers only. We volunteers have come to be a close bunch of friends and we organised a trip for ourselves to go on a leisure cycling trip to Penggaran... so we saw each other a bit more that year. One of the kids' camps was an overseas one. For the first time ever, Happy Friends Club brought the kids out of Singapore, into Malacca. It was a trip with the MDAS (Muscular Dystrophy Association of Singapore) kids. I was paired with a great kid named Isaac who was both autistic and had DMD (Duchenne Muscular Dystrophy). One of my JC best friends PY was paired with Shalom, Isaac's younger brother, who also had DMD. As this was an overseas trip, the family of the kids came along. PY and I got on very well with the boys' family and we continued to keep in touch with them after the camp. A short while after the Malacca camp, Isaac's mum asked if I could see if any male volunteer wanted to give the boys tuition. J, a fellow Happy Friends Club member volunteered. It was a stroke of luck for PY and I that J stayed near us in the west, and had a car. So every week, we would follow him to the boys' house and play with the boys after tuition. Hubbs was one of J's best friends since their uni time, so he started to come along as well. Thus, the four of us started to hang out quite a bit since the tuition was a weekly affair. By 2002, hubbs and I were both single. I don't know when exactly did hubbs start to see me as potential candidate for a girlfriend. But I know I didn't see him as a potential boyfriend candidate at all. Personality wise, he was a great guy. But he smoked a lot and drank a lot, not exactly traits that I liked. Plus he was still 7 years older, though the age gap didn't seem so wide now that I had graduated and was working. Oh and he was quite a ching chong fella, very different from the anglicised me. Then in early 2003, hubbs started to find excuses to meet me individually, as opposed to meeting me with PY and J. It kinda helped (him!) that J & PY had gotten together as a couple in end 2002. So I didn't really suspect anything when he asked me out for dinner alone, asked me to help him correct his English on a project he was working on, asked to go catch a movie with him coz J wasn't free... Then suddenly, one day, I realised that I was meeting him almost every night the past two weeks. And I got suspicious, like "Does he like me THAT WAY?!" This year marks our 7th year anniversary as a wedded couple and our 9th year together. Despite the fact that hubbs hairline has receded even further, and SpideyGal has morphed into Miss Piggy, we know that we have been very blessed and we are very thankful for all that we have. May the good Lord bless us with many more good years to come! And to my dear Kermit Prince, thank you, too! *muakz* ! He quit smoking because he wants to. Yes, it is! That's one thing I forgot to mention, it was great being friends before we fell in love, coz then he would have seen me at my worst, and me him! *grinz* hahaha and thank YOU for starting this linky! :) Very entertaining! I love your story Pam!! 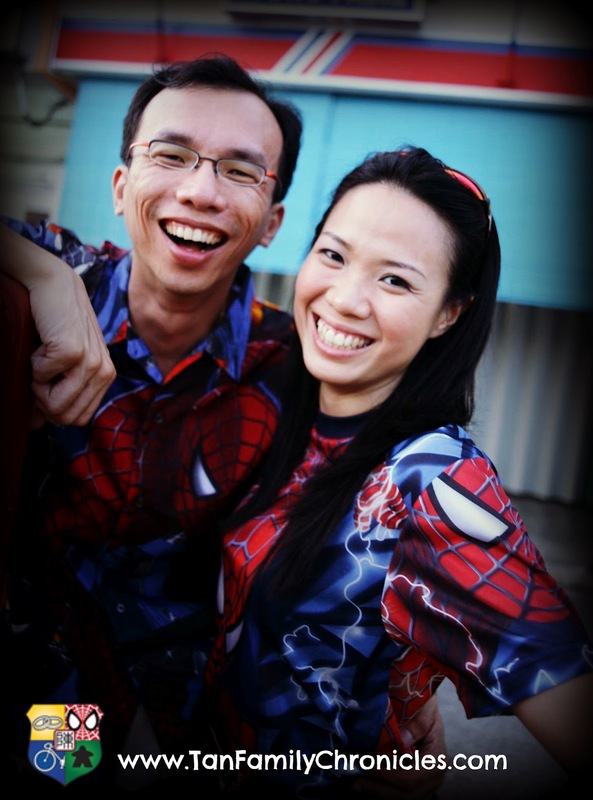 And that last photo of you both in spidey tees - absolutely gorgeous!! Hilarious post (+the other ones you linked to this)! Sibeh funny can? Lol! Lovely post to read on a gloomy rainy Wednesday. Love this love story of miss spidey and mr kermit. You two really have a heart of gold and I'm sure it's something that you'll pass on to your kids too.